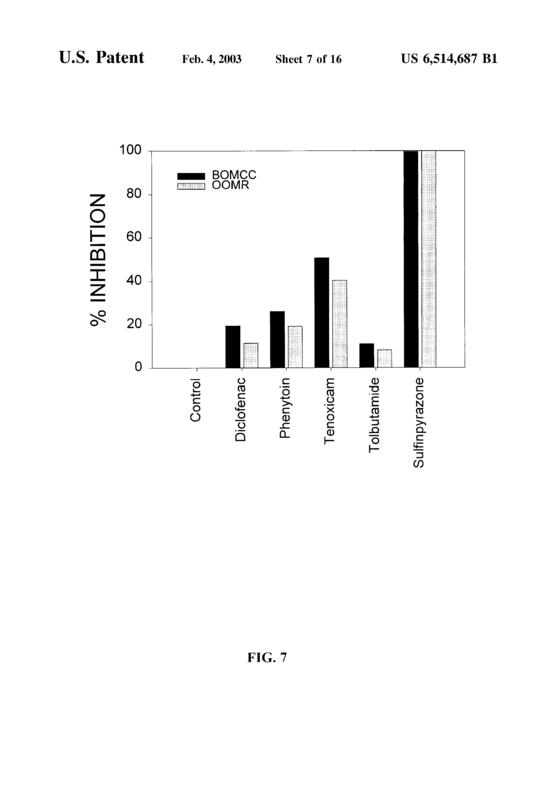 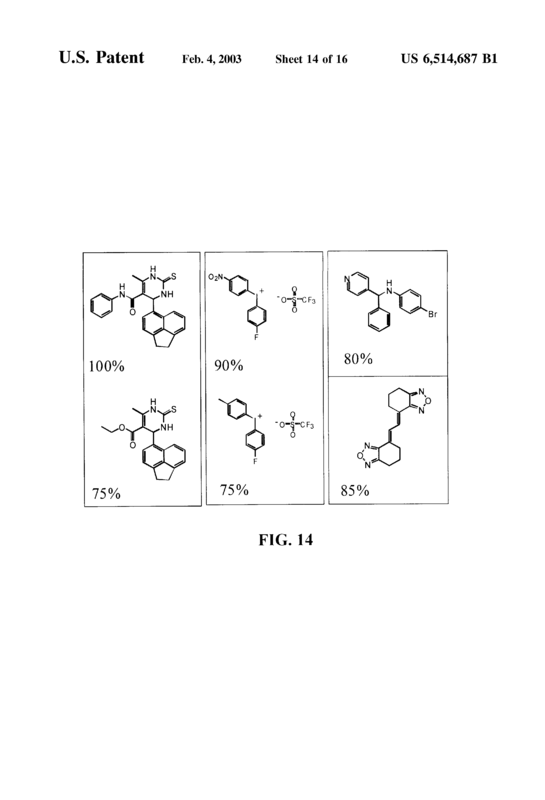 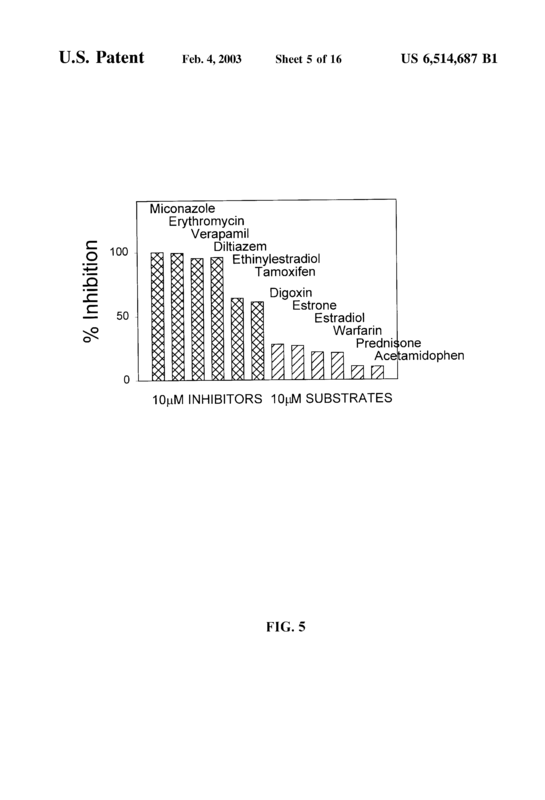 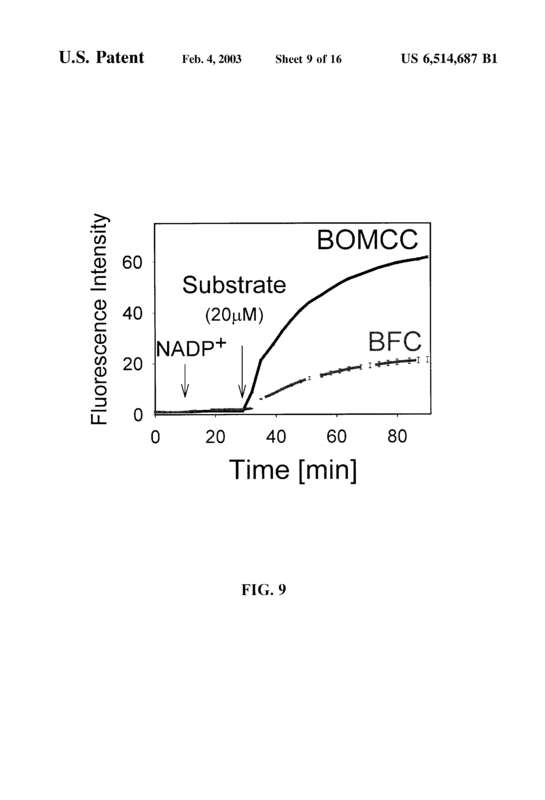 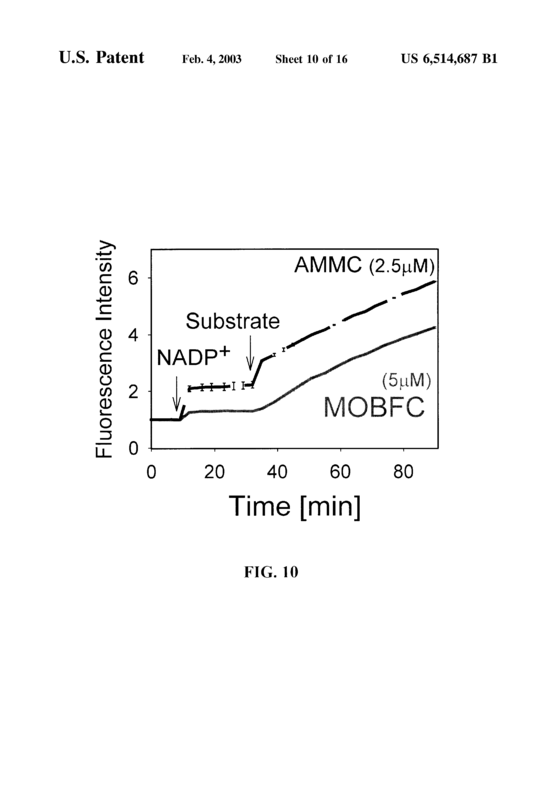 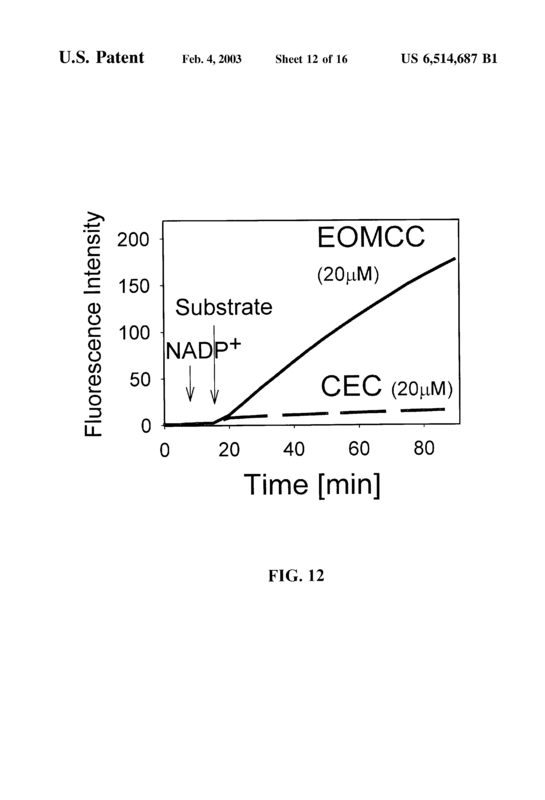 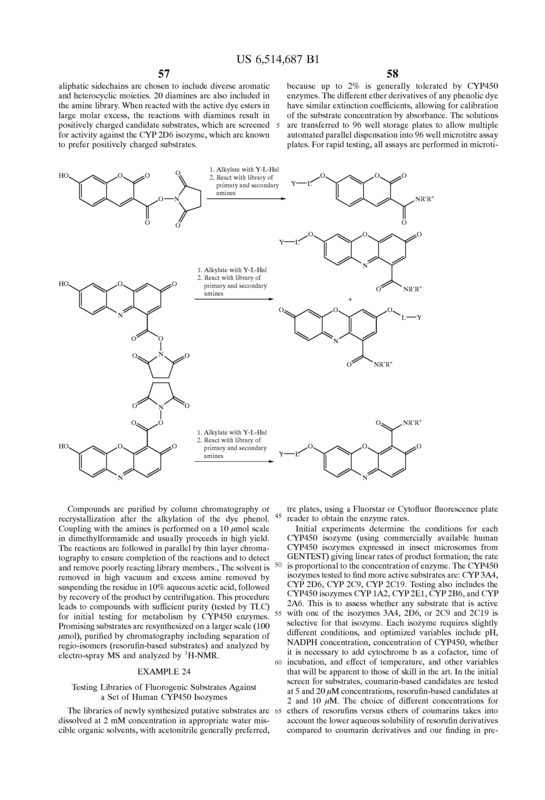 The invention provides a compound, useful as an optical probe or sensor of the activity of at least one cytochrome P450 enzyme, and methods of using the compound to screen candidate drugs, and candidate drugs identified by these methods. 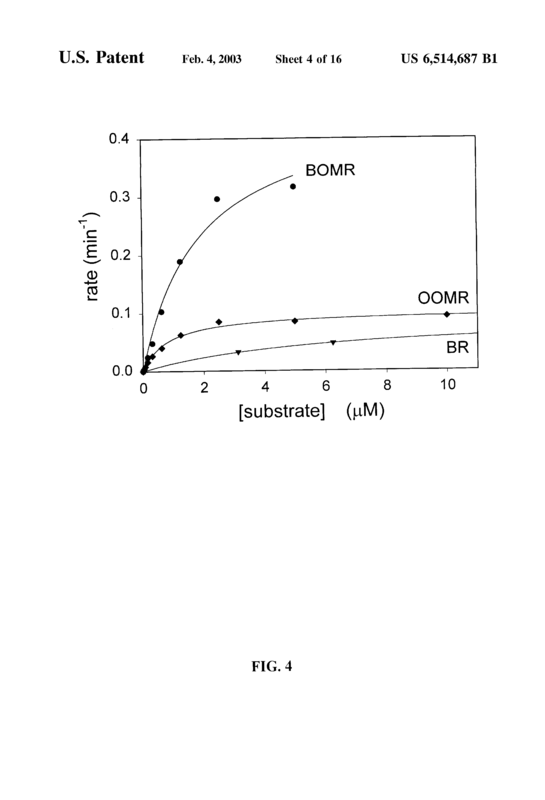 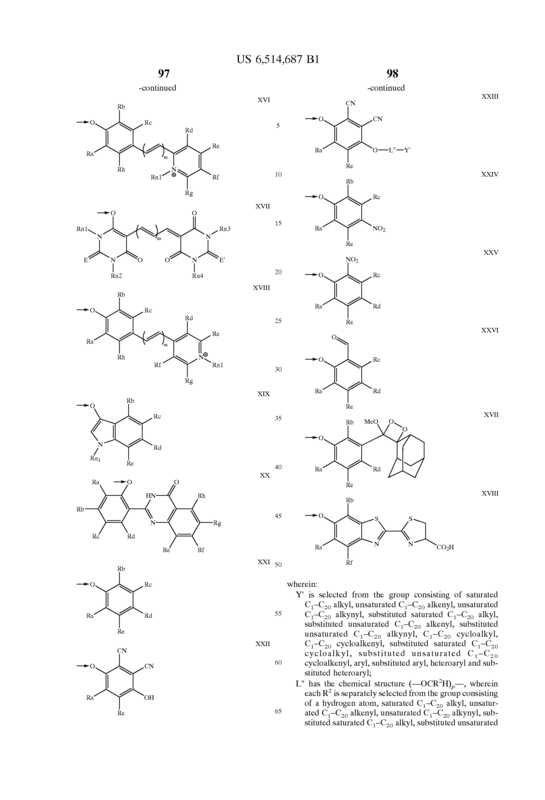 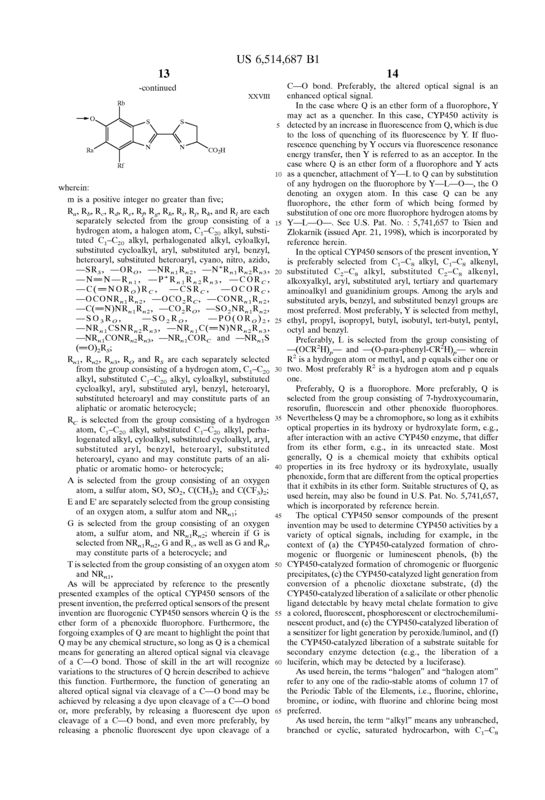 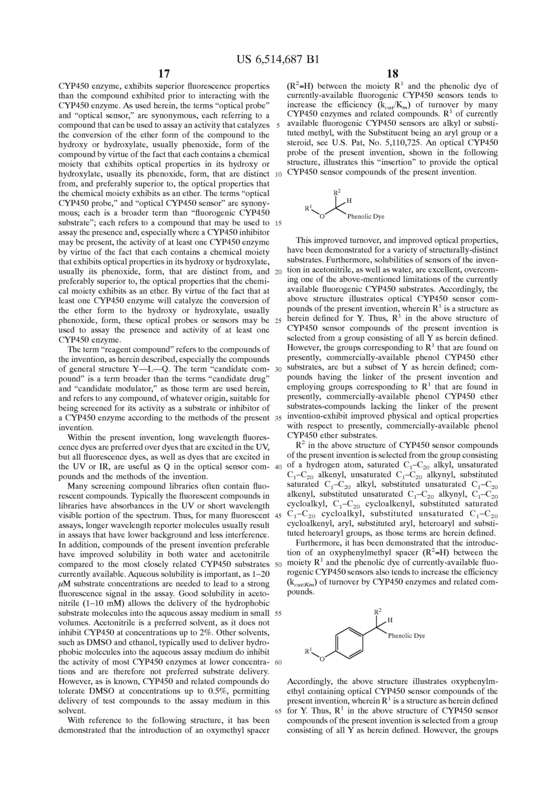 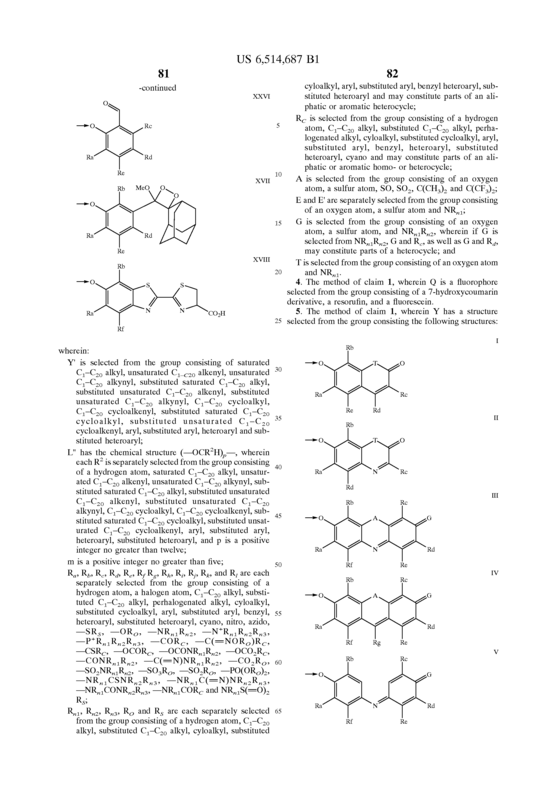 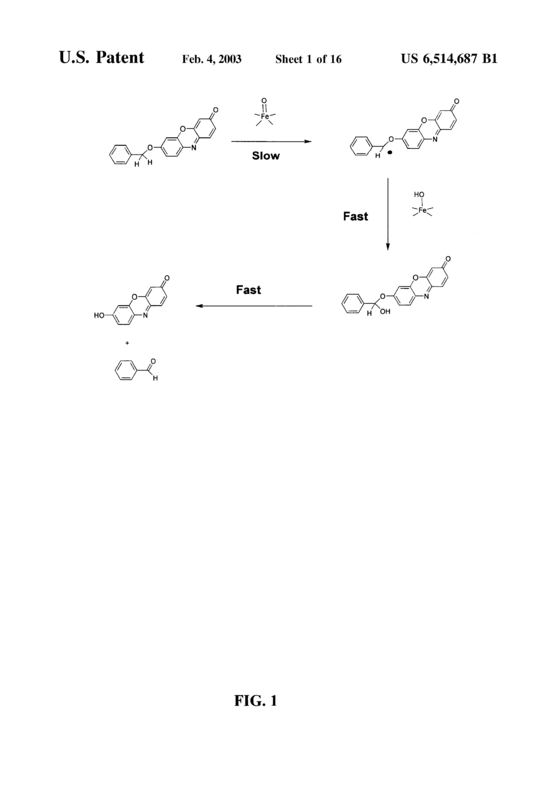 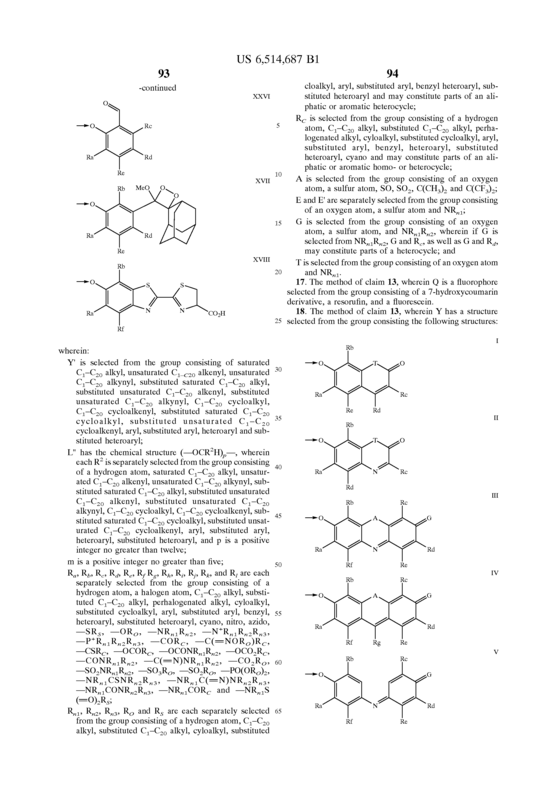 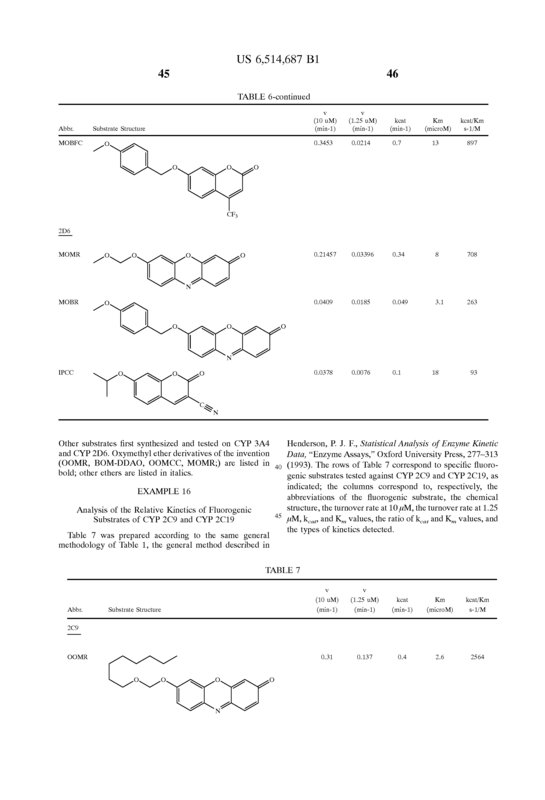 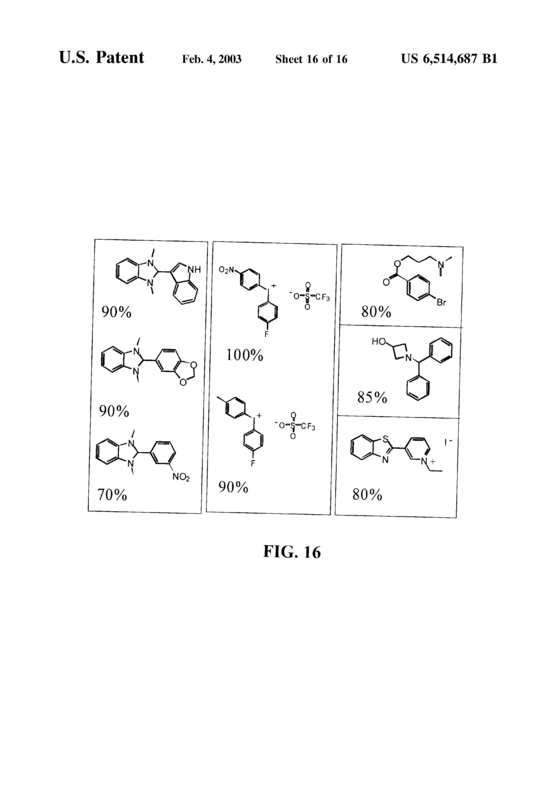 The optical probe of the invention is a compound having the generic structure Y-L-Q, wherein Y is selected from the group consisting of Q as herein defined, saturated C1-C20 alkyl, unsaturated C1-C20 alkenyl, unsaturated C1-C20 alkynyl, substituted saturated C1-C20 alkyl, substituted unsaturated C1-C20 alkenyl, substituted unsaturated C1-C20 alkynyl, C1-C20 cycloalkyl, C1-C20 cycloalkenyl, substituted saturated C1-C20 cycloalkyl, substituted unsaturated C1-C20 cycloalkenyl, aryl, substituted aryl, heteroaryl and substituted heteroaryl; L is selected from the group of (-OCR2H)p-, wherein for each p, all R2 are separately selected from the group consisting of a hydrogen atom, saturated C1-C20 alkyl, unsaturated C1-C20 alkenyl, unsaturated C1-C20 alkynyl, substituted saturated C1-C20 alkyl, substituted unsaturated C1-C20 alkenyl, substituted unsaturated C1-C20 alkynyl, C1-C20 cycloalkyl, C1-C20 cycloalkenyl, substituted saturated C1-C20 cycloalkyl, substituted unsaturated C1-C20 cycloalkenyl, aryl, substituted aryl, heteroaryl, substituted heteroaryl, and p is a positive integer no greater than twelve; and Q is a chemical moiety that gives rise to optical properties in its hydroxy or hyrdoxylate, phenol or phenoxide form that are different from the optical properties that arise from its ether form. 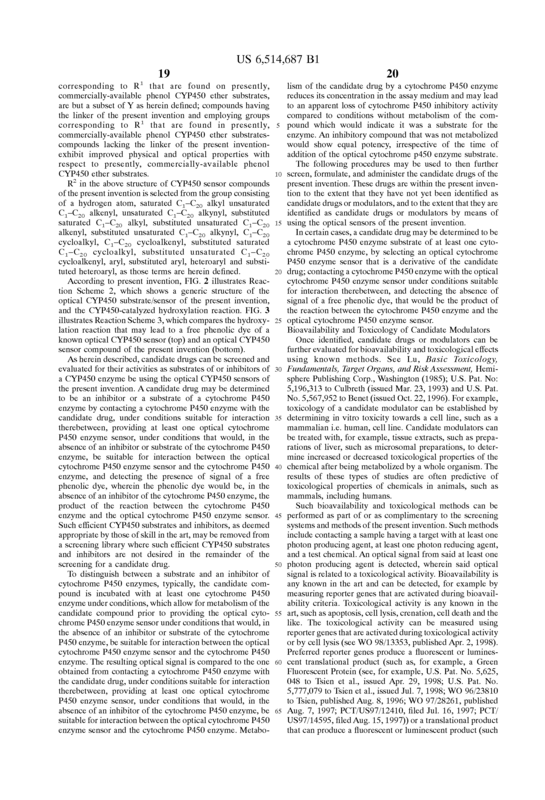 Most preferably, p is one, R2 is hydrogen, and Q is the ether form of a phenoxide fluorophore. 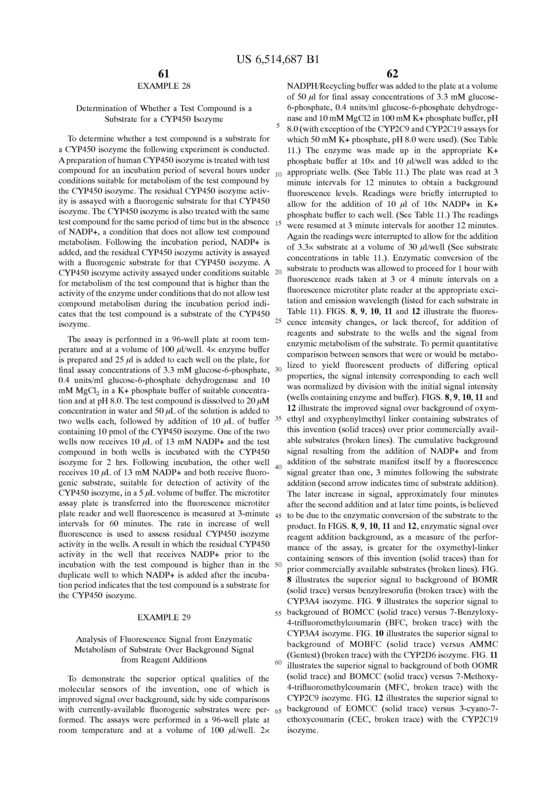 detecting an optical signal, if any, resulting from interaction of the reagent compound with the CYP450 enzyme. 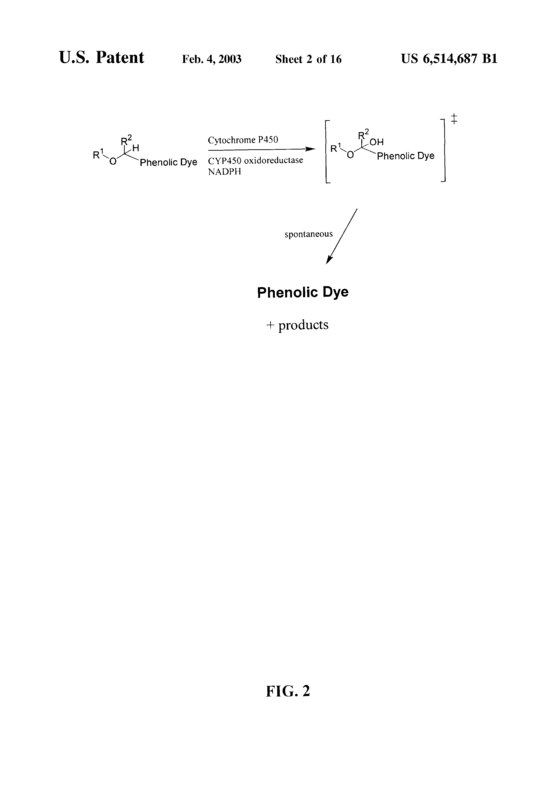 The method of claim 1 , wherein Q is a chemical means for releasing a phenolic fluorescent dye upon cleavage of a C—O bond. 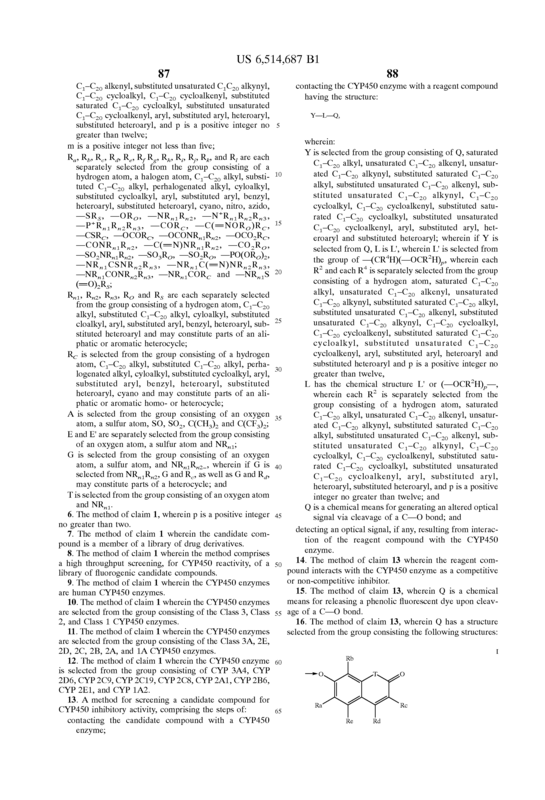 T is selected from the group consisting of an oxygen atom and NR n1 . 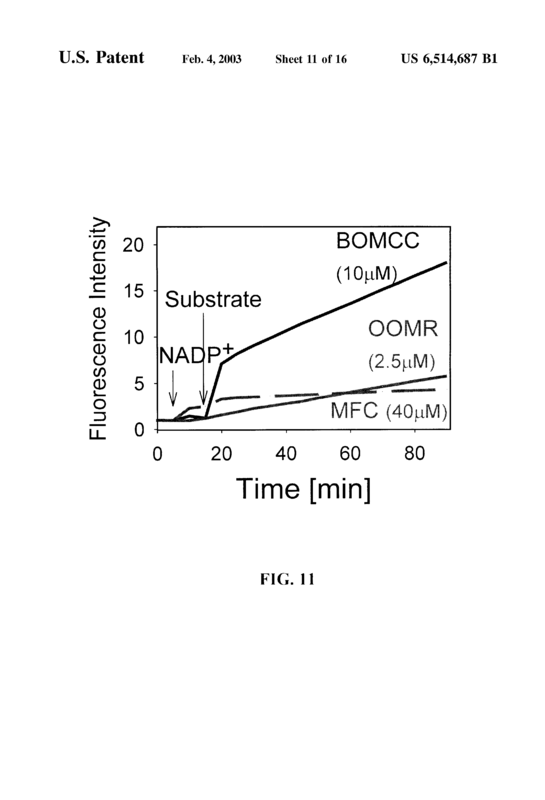 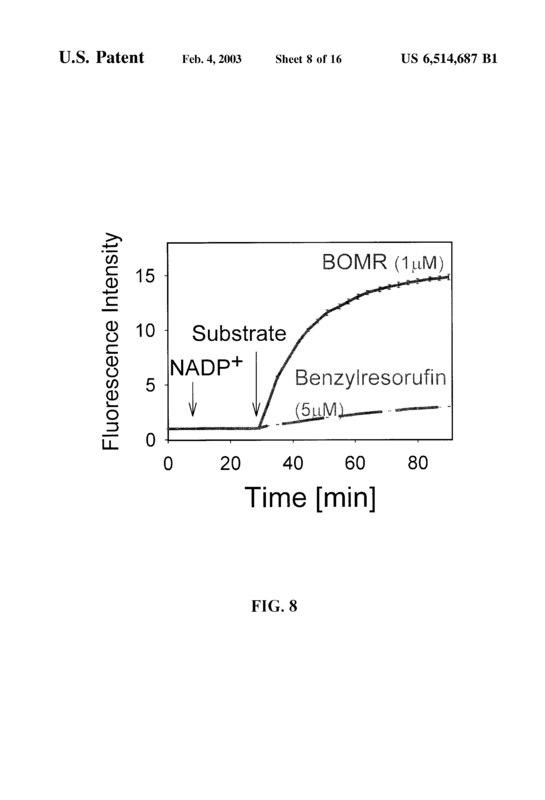 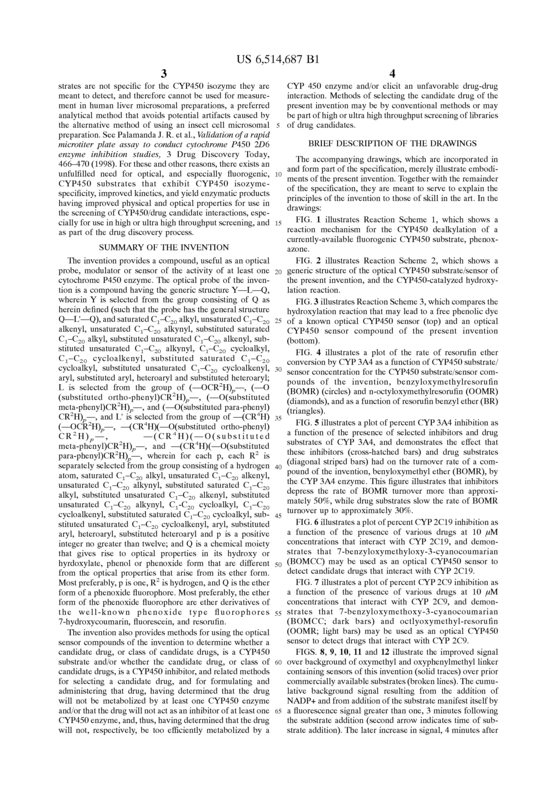 The method of claim 1 , wherein Q is a fluorophore selected from the group consisting of a 7-hydroxycoumarin derivative, a resorufin, and a fluorescein. 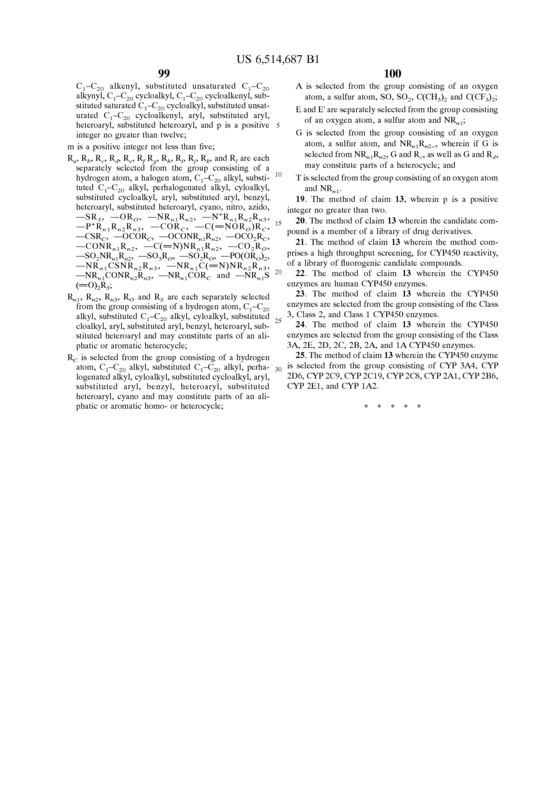 The method of claim 1 , wherein p is a positive integer no greater than two. 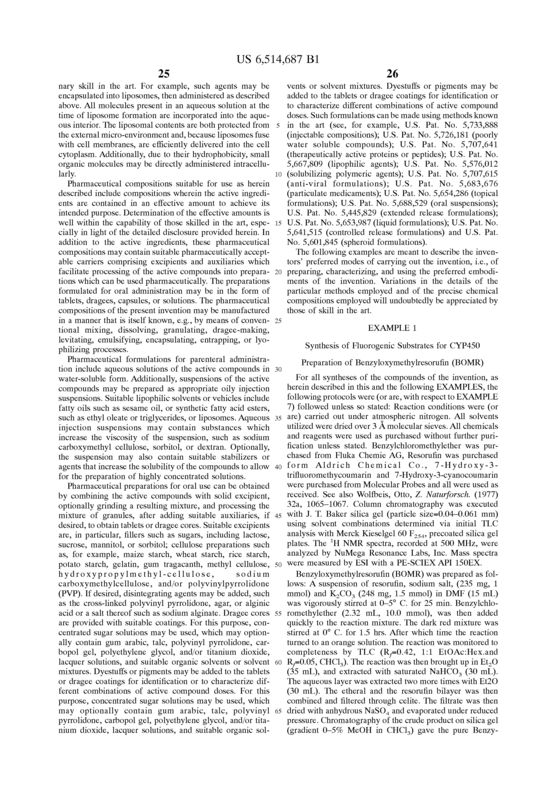 The method of claim 1 wherein the candidate compound is a member of a library of drug derivatives. 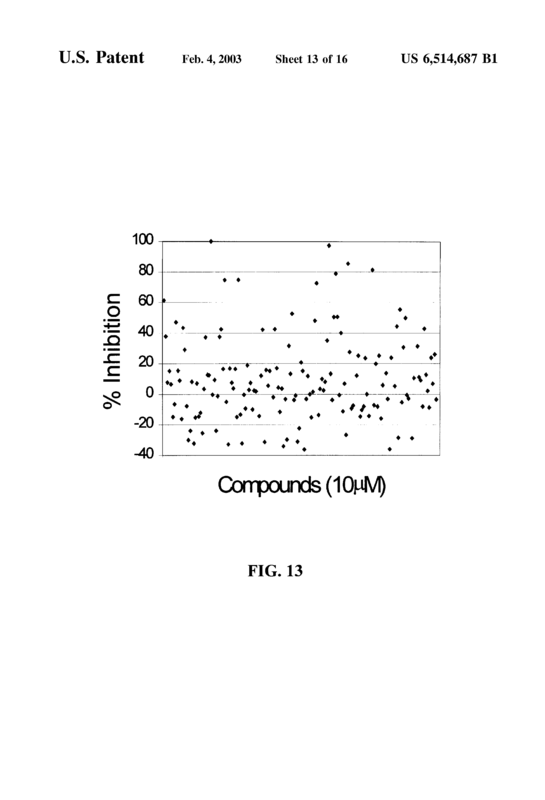 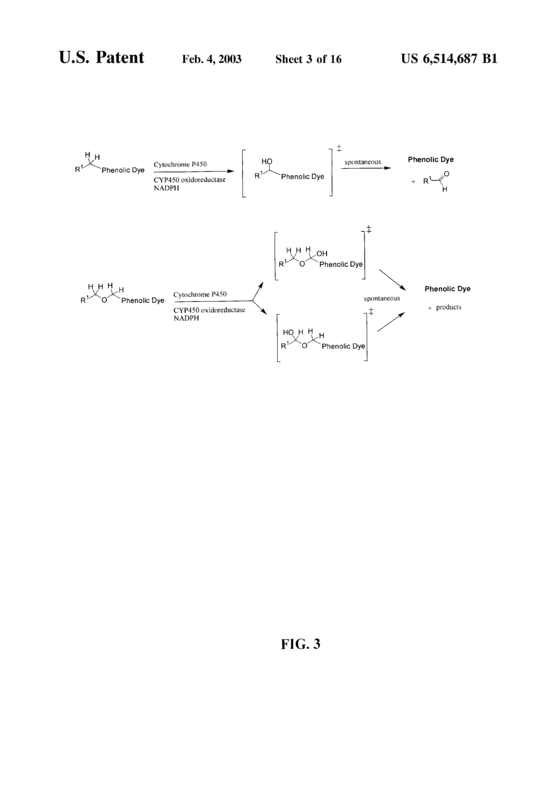 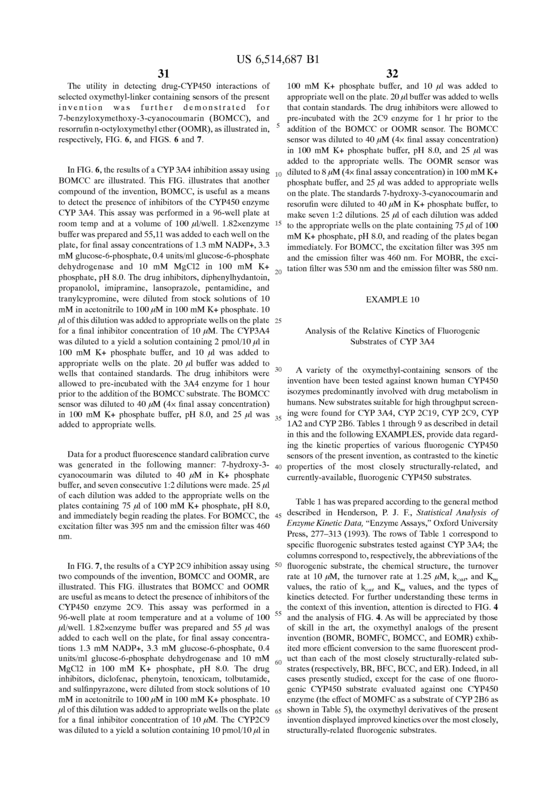 The method of claim 1 wherein the method comprises a high throughput screening, for CYP450 reactivity, of a library of fluorogenic candidate compounds. 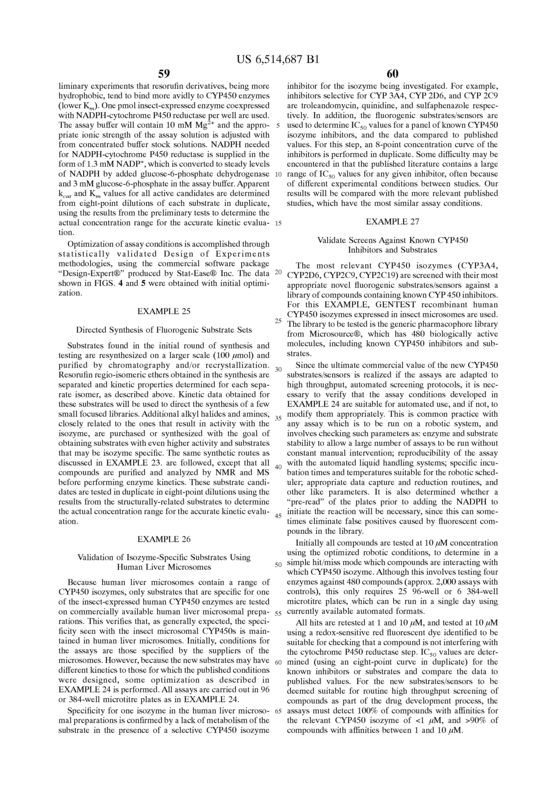 The method of claim 1 wherein the CYP450 enzymes are human CYP450 enzymes. 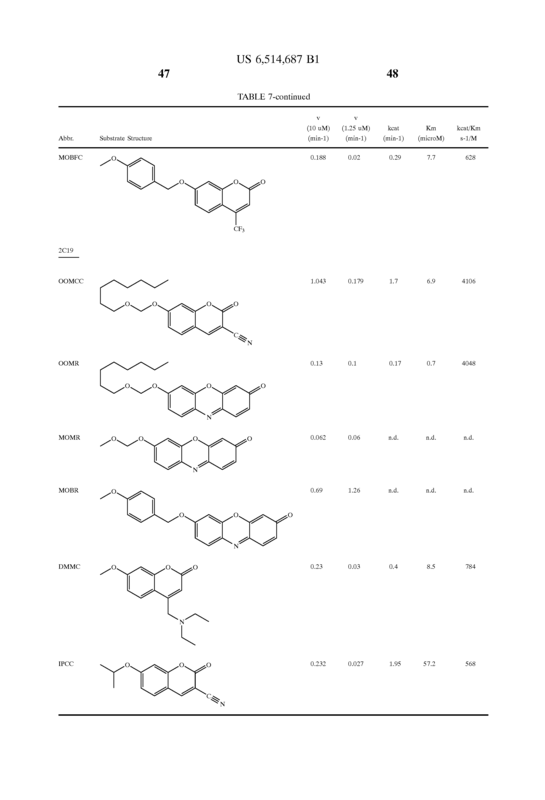 The method of claim 1 wherein the CYP450 enzymes are selected from the group consisting of the Class 3, Class 2, and Class 1 CYP450 enzymes. 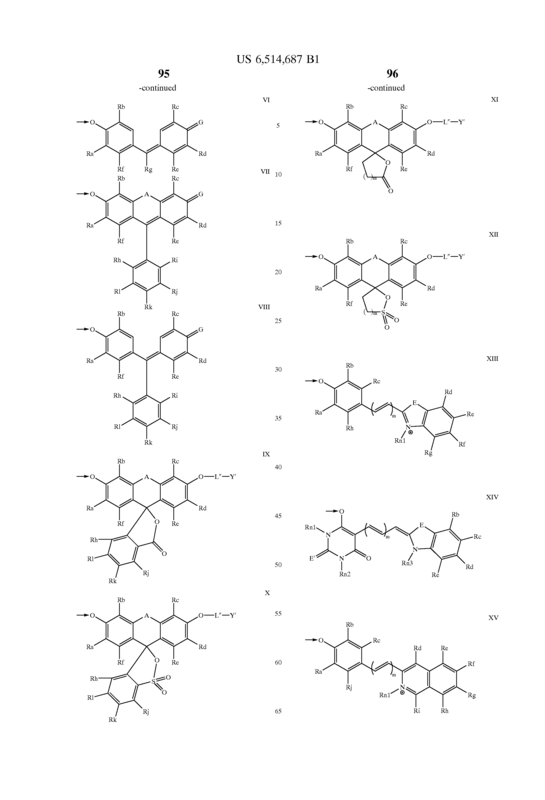 The method of claim 1 wherein the CYP450 enzymes are selected from the group consisting of the Class 3A, 2E, 2D, 2C, 2B, 2A, and 1A CYP450 enzymes. 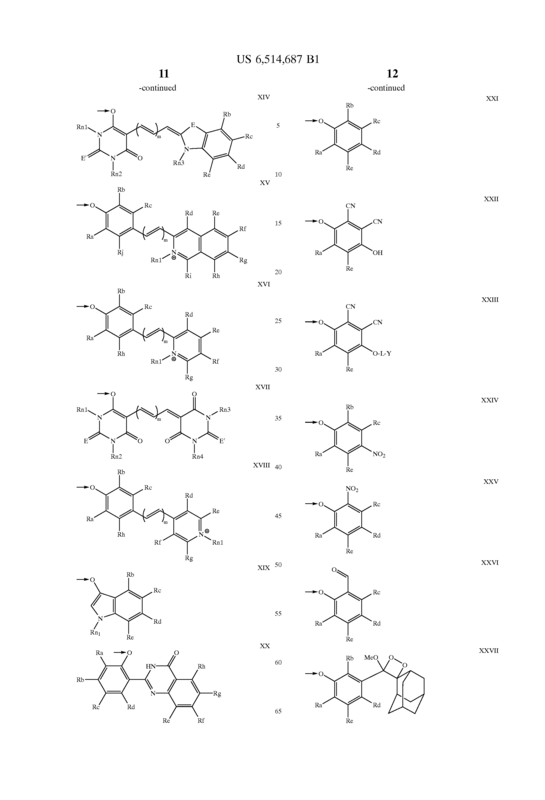 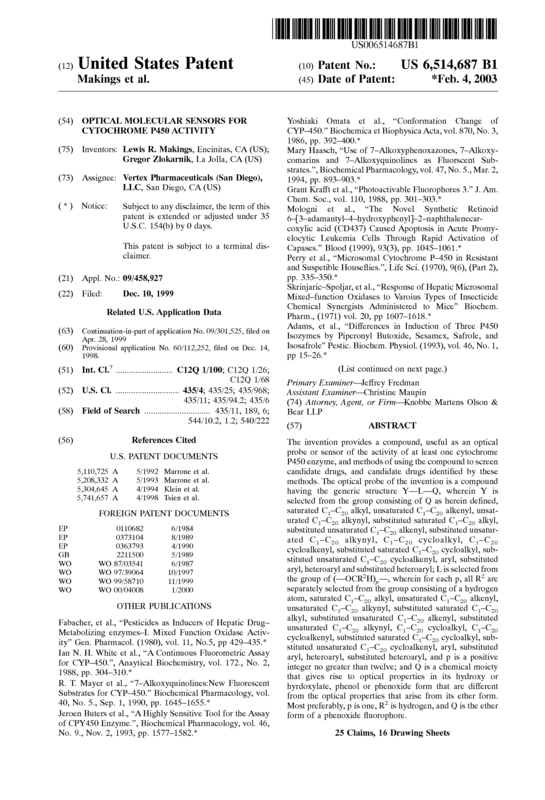 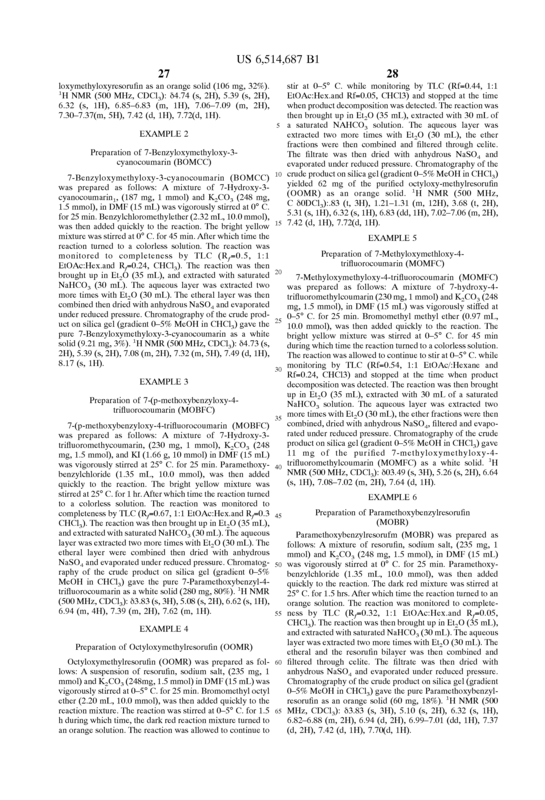 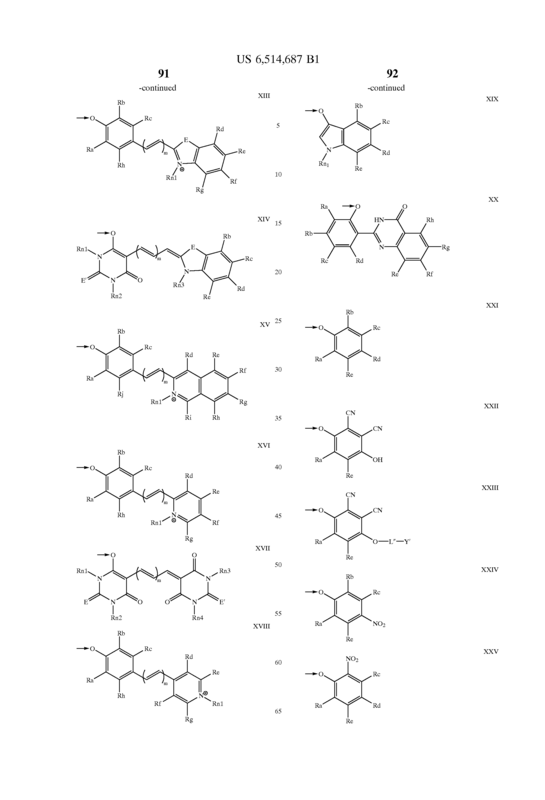 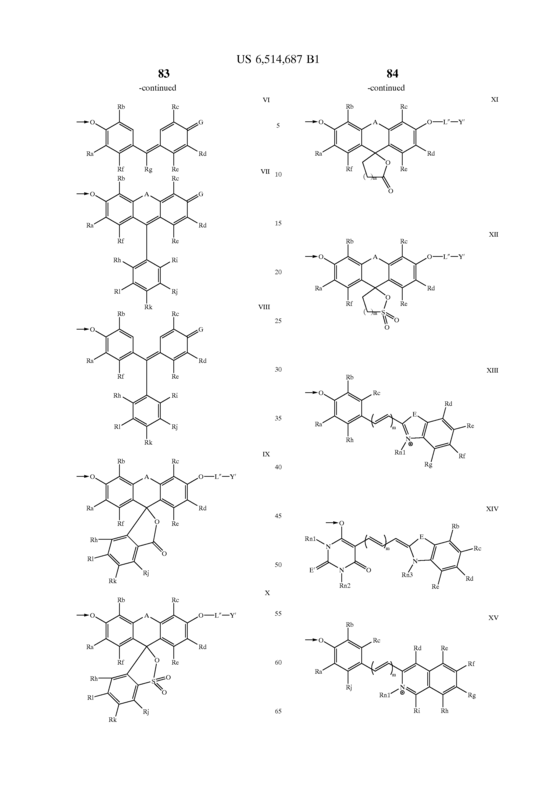 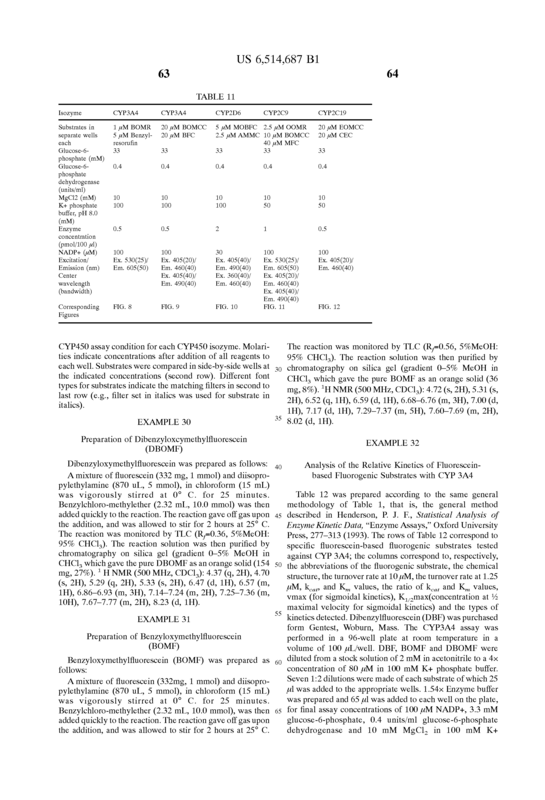 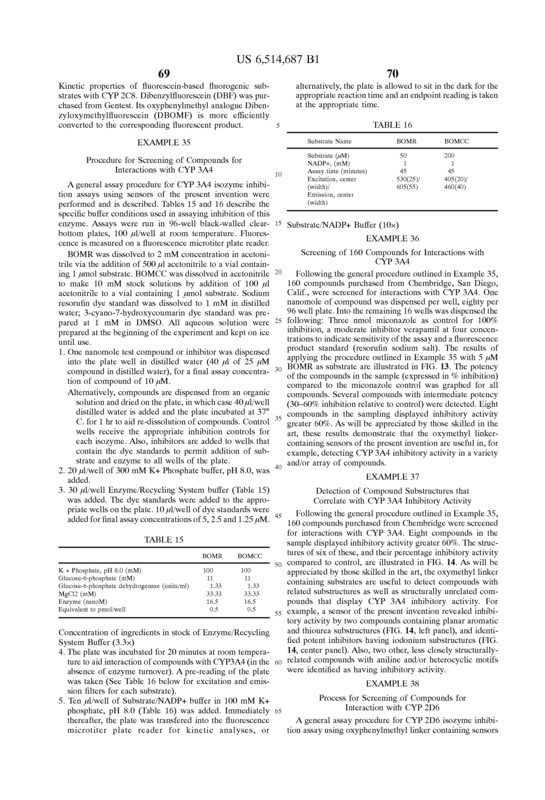 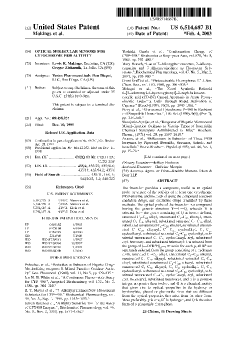 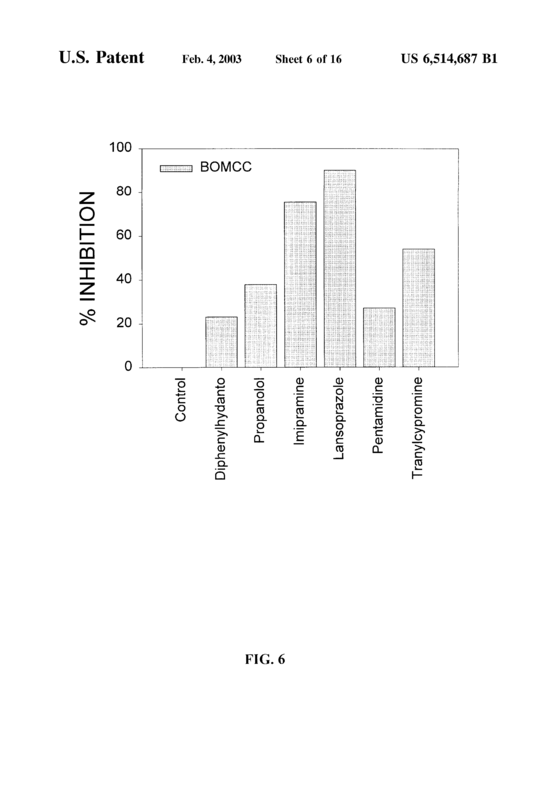 The method of claim 1 wherein the CYP450 enzyme is selected from the group consisting of CYP 3A4, CYP 2D6, CYP 2C9, CYP 2C19, CYP 2C8, CYP 2A1, CYP 2B6, CYP 2E1, and CYP 1A2. 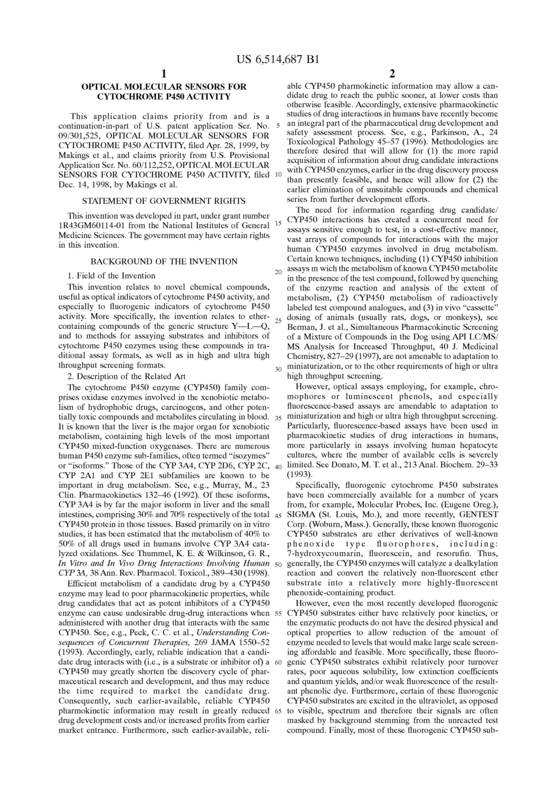 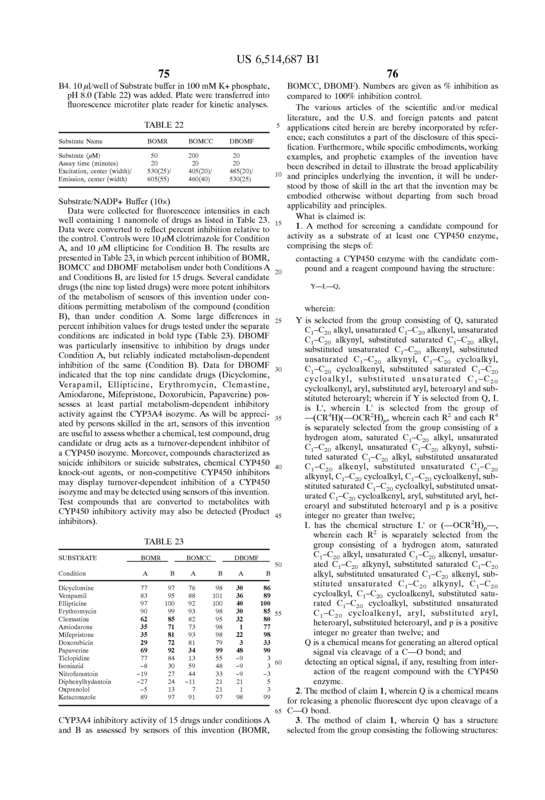 The method of claim 13 wherein the reagent compound interacts with the CYP450 enzyme as a competitive or non-competitive inhibitor. 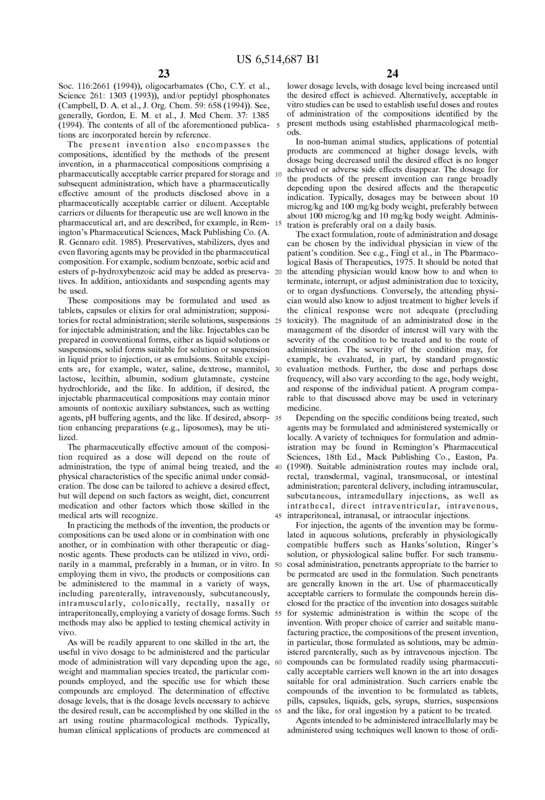 The method of claim 13 , wherein Q is a chemical means for releasing a phenolic fluorescent dye upon cleavage of a C—O bond. 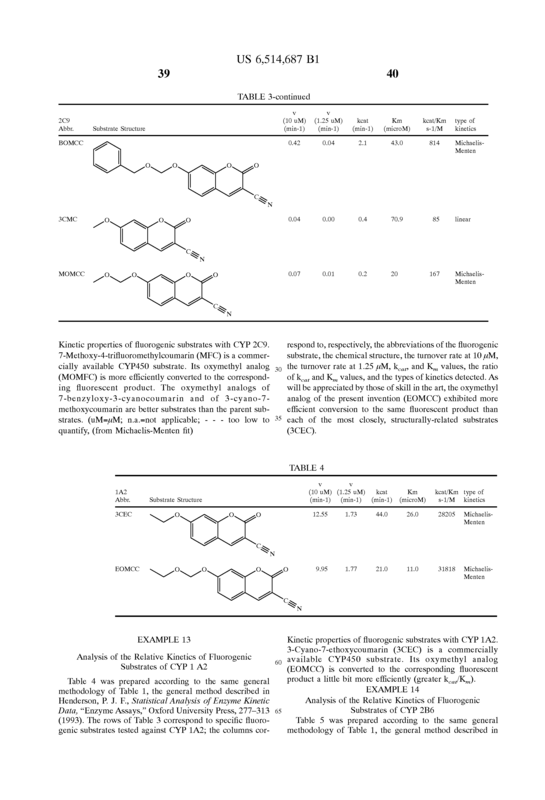 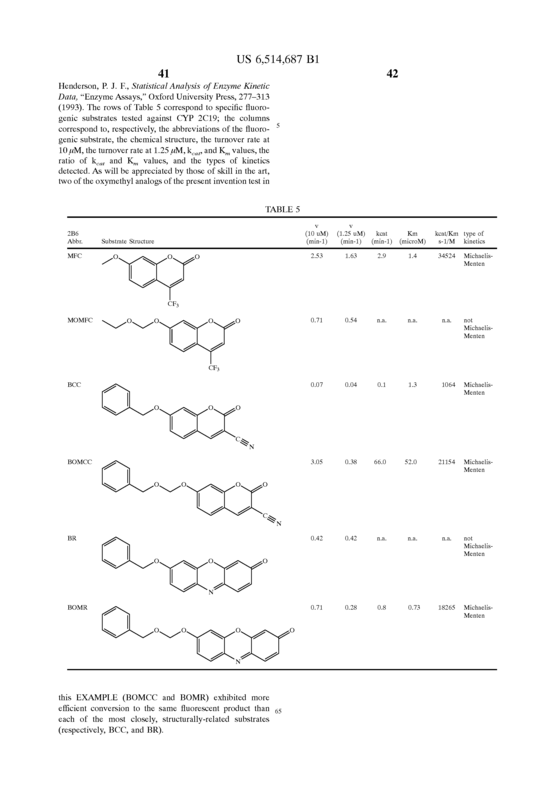 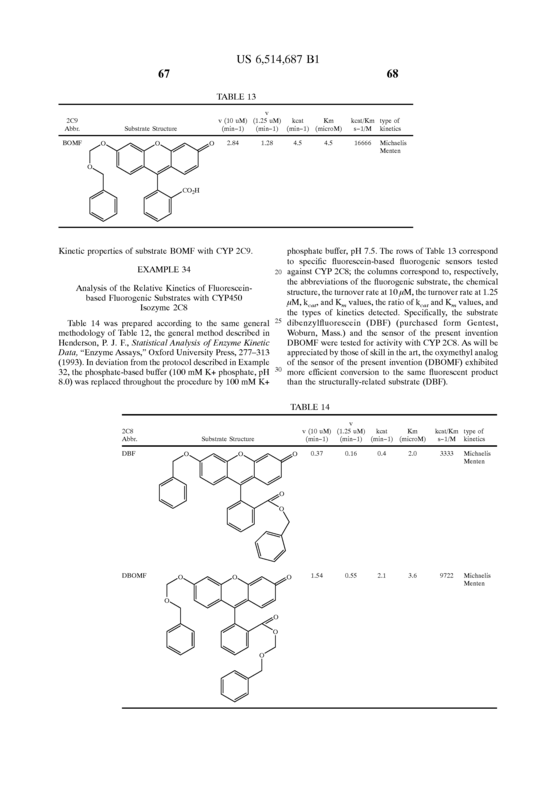 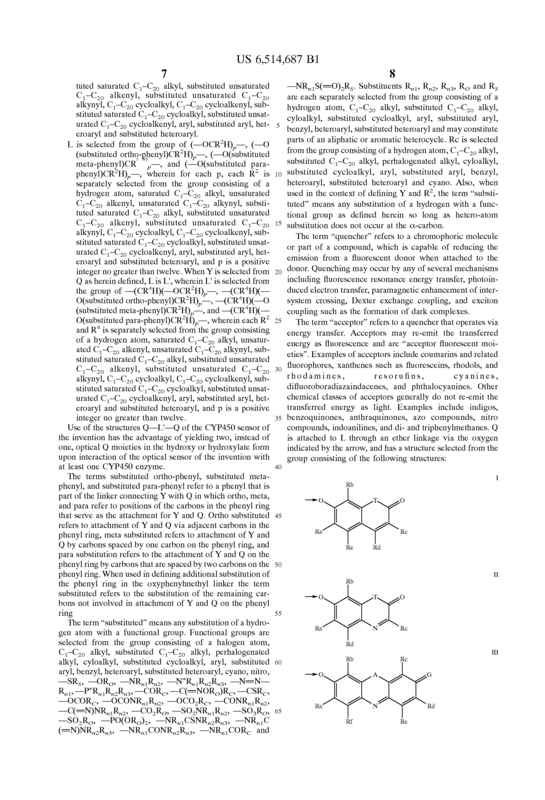 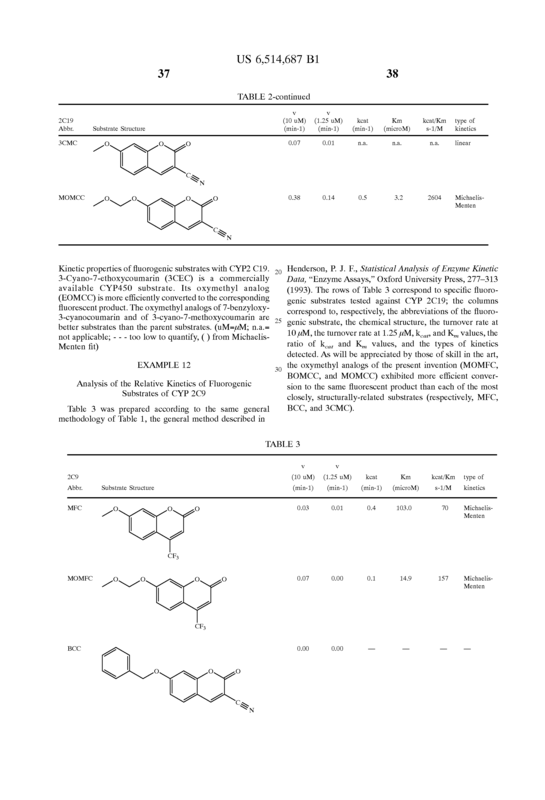 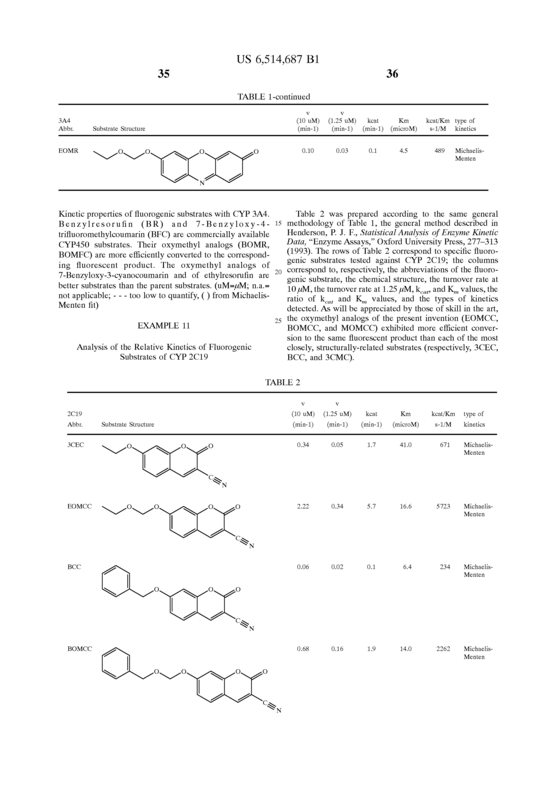 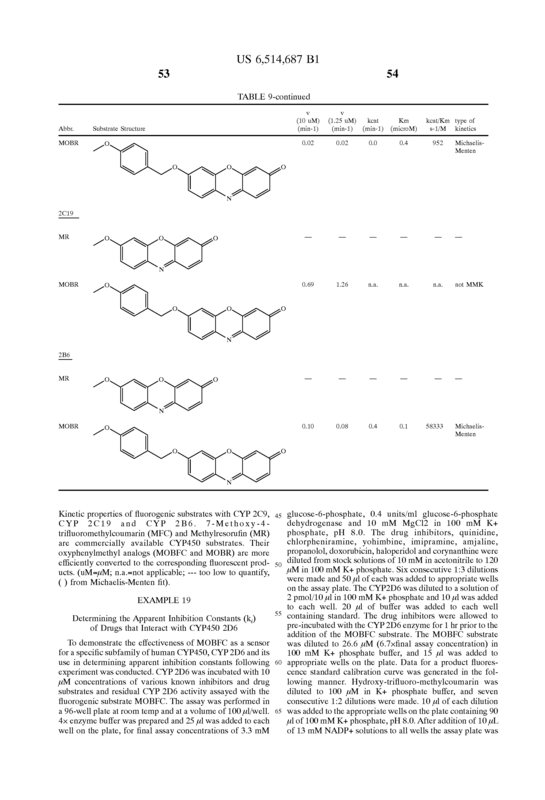 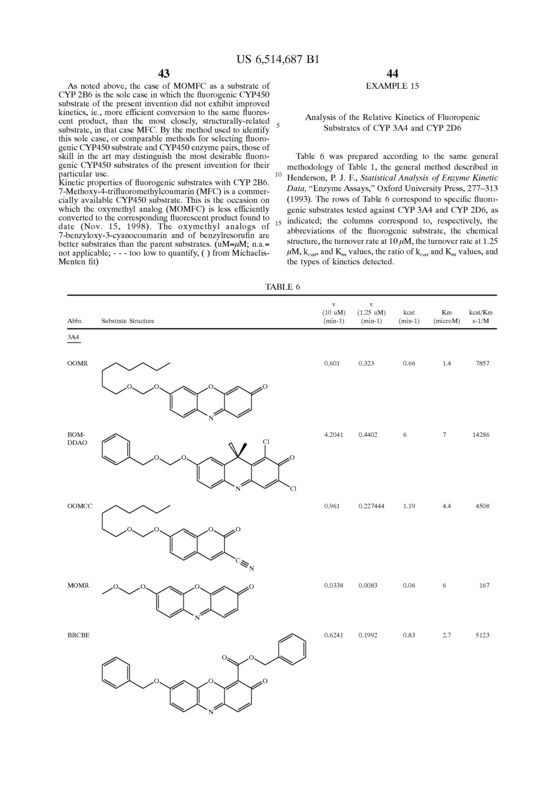 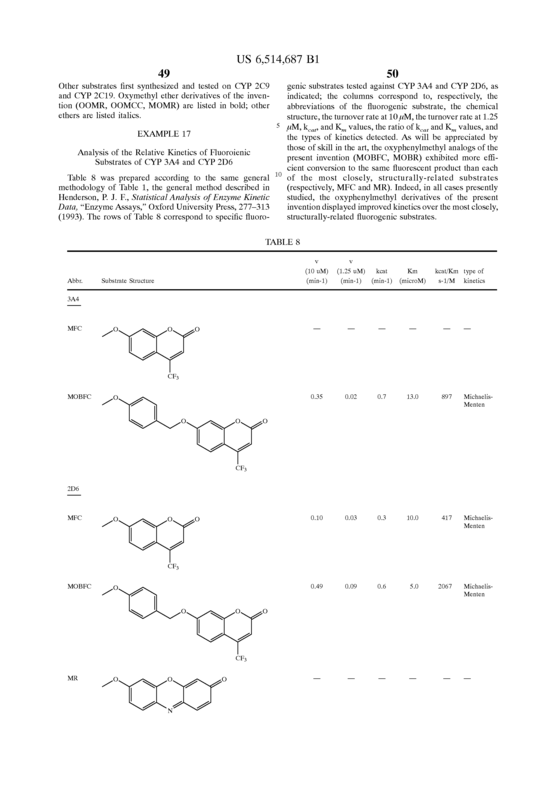 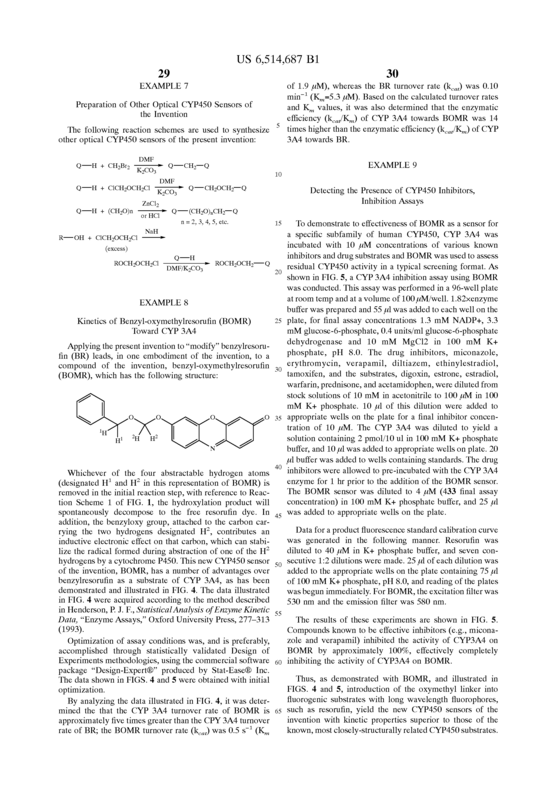 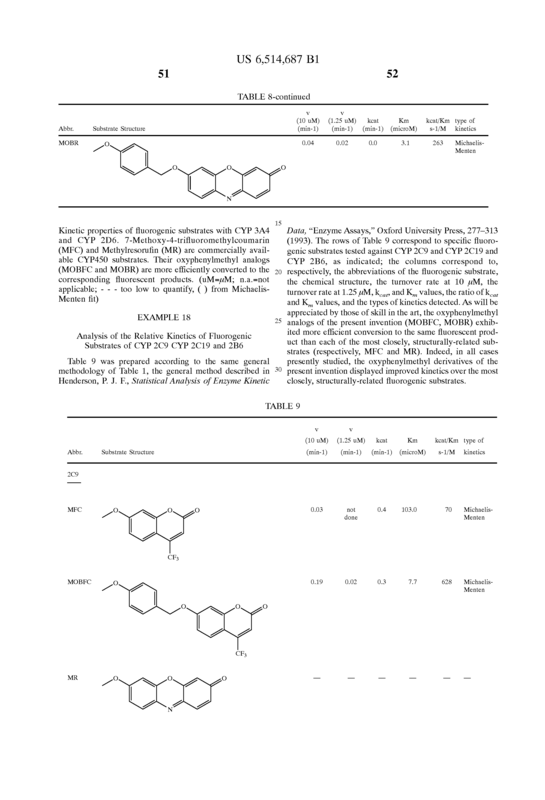 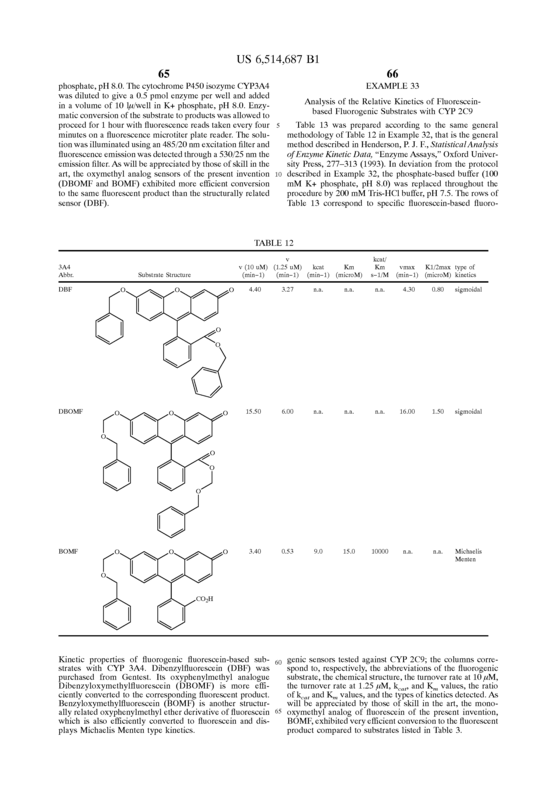 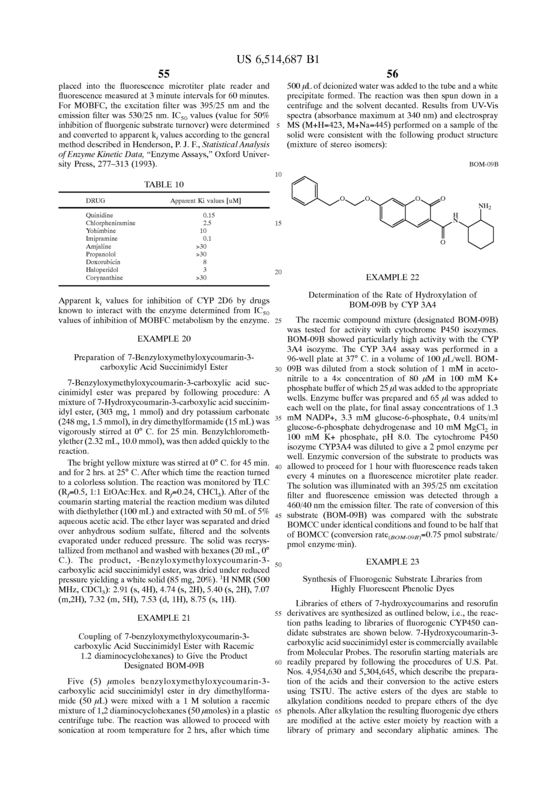 The method of claim 13 , wherein Q is a fluorophore selected from the group consisting of a 7-hydroxycoumarin derivative, a resorufin, and a fluorescein. 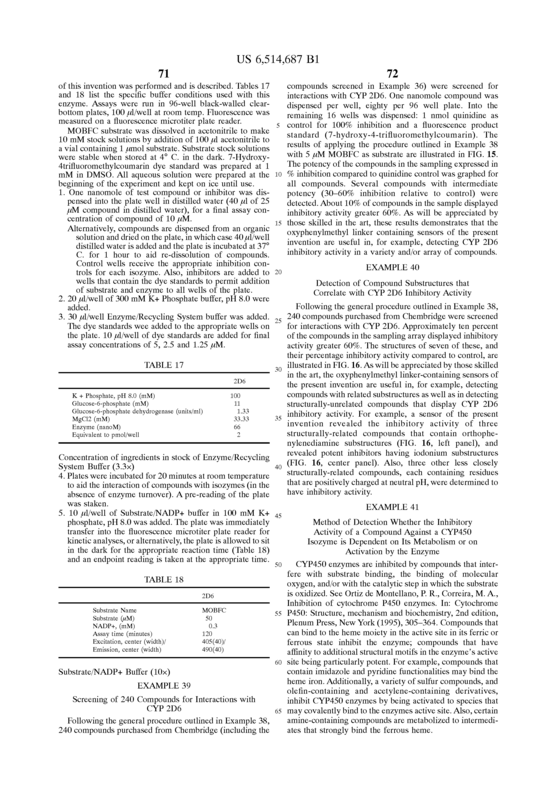 The method of claim 13 , wherein p is a positive integer no greater than two. 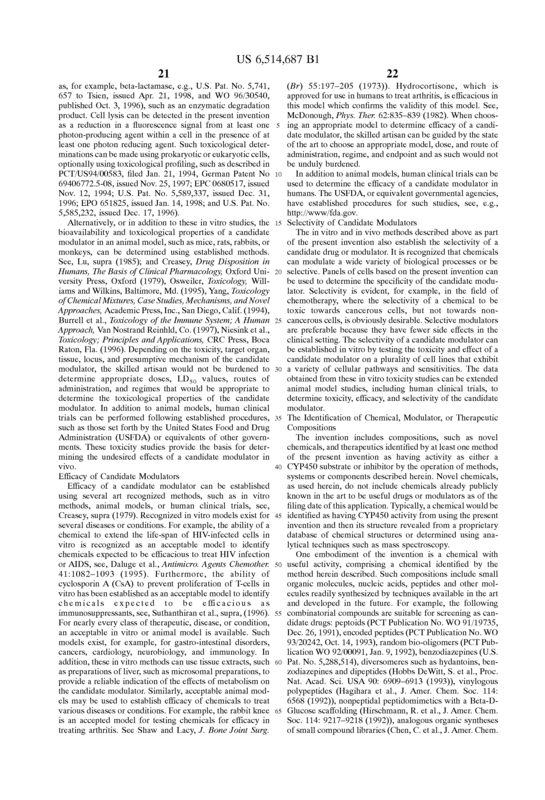 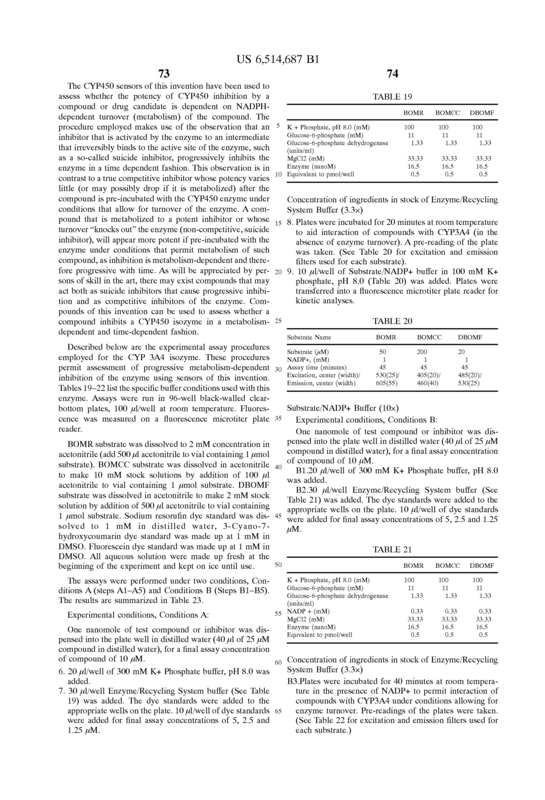 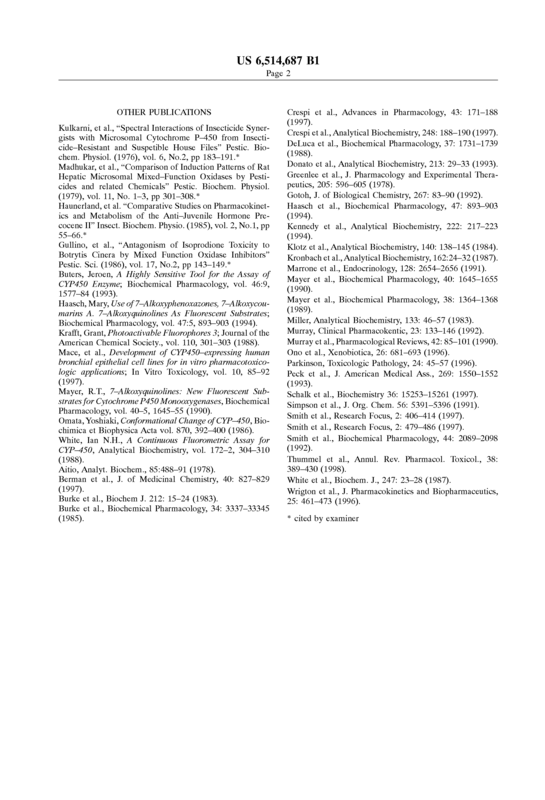 The method of claim 13 wherein the candidate compound is a member of a library of drug derivatives. 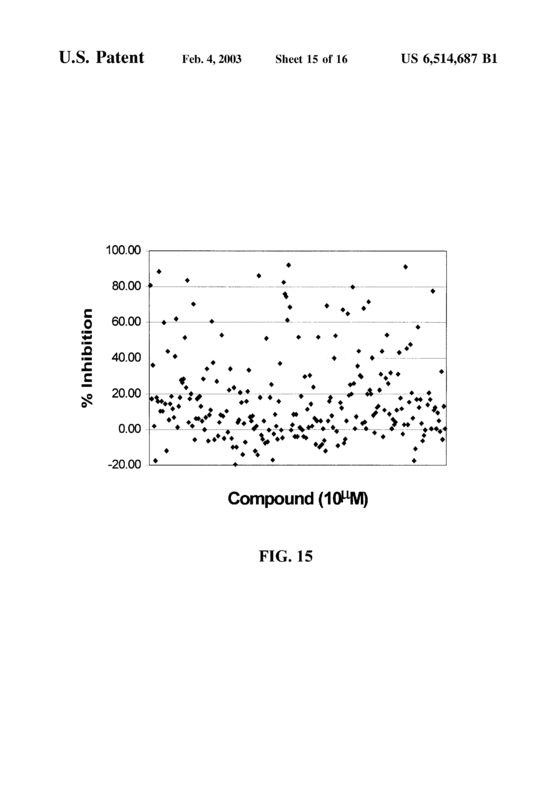 The method of claim 13 wherein the method comprises a high throughput screening, for CYP450 reactivity, of a library of fluorogenic candidate compounds. 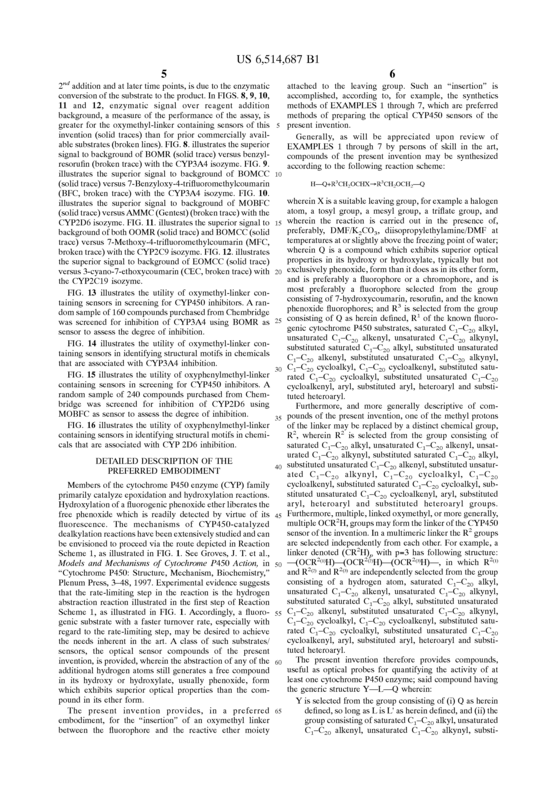 The method of claim 13 wherein the CYP450 enzymes are human CYP450 enzymes. 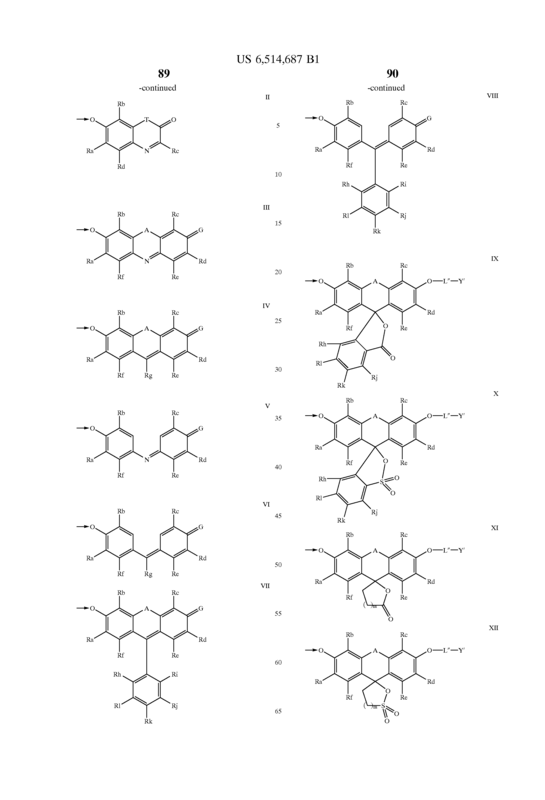 The method of claim 13 wherein the CYP450 enzymes are selected from the group consisting of the Class 3, Class 2, and Class 1 CYP450 enzymes. 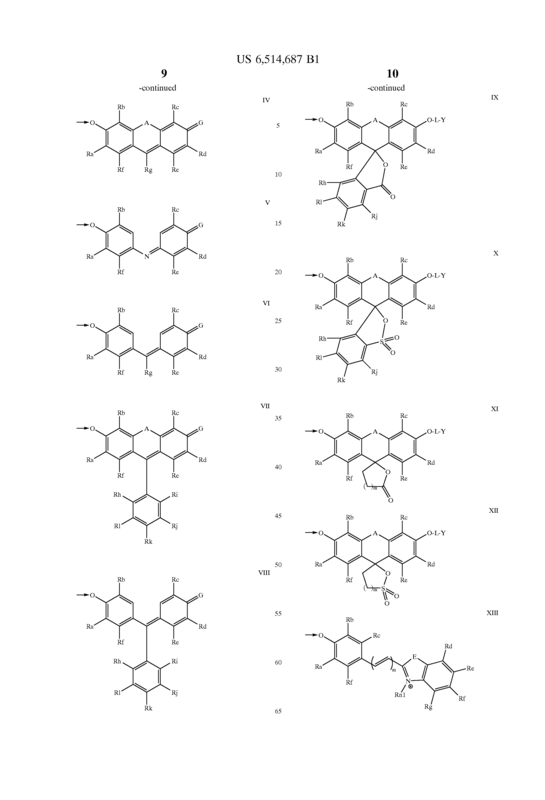 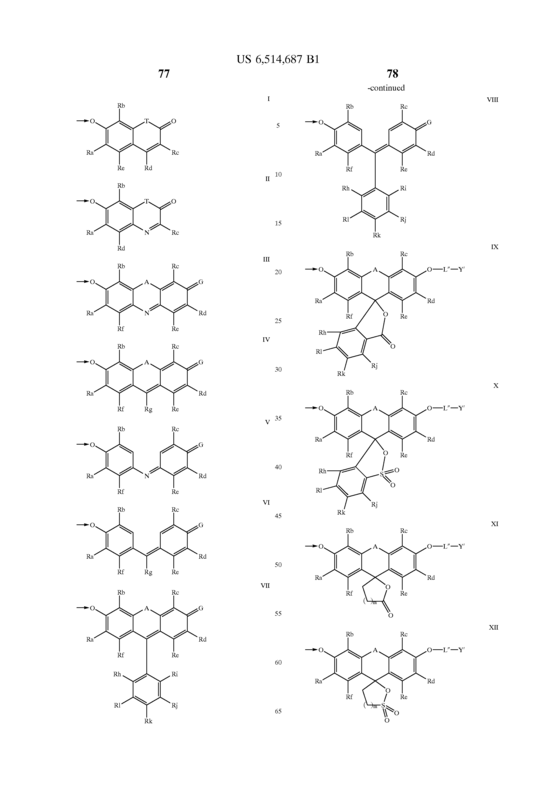 The method of claim 13 wherein the CYP450 enzymes are selected from the group consisting of the Class 3A, 2E, 2D, 2C, 2B, 2A, and 1A CYP450 enzymes. 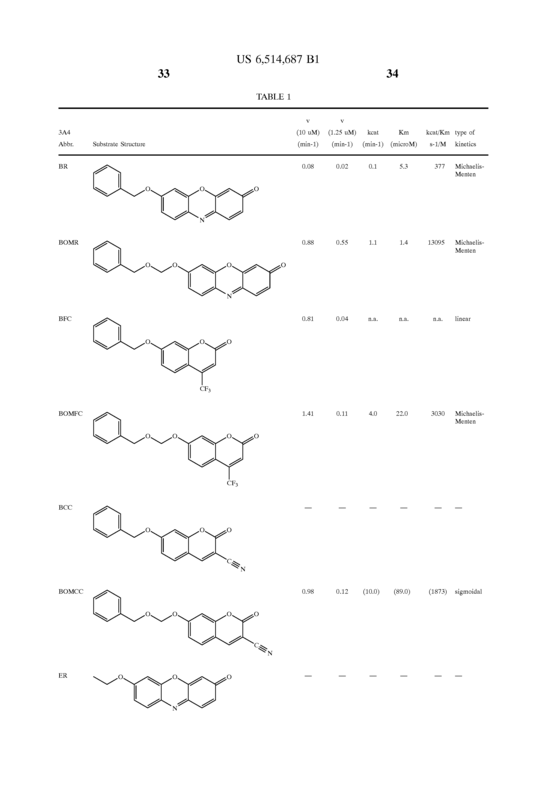 The method of claim 13 wherein the CYP450 enzyme is selected from the group consisting of CYP 3A4, CYP 2D6, CYP 2C9, CYP 2C19, CYP 2C8, CYP 2A1, CYP 2B6, CYP 2E1, and CYP 1A2.